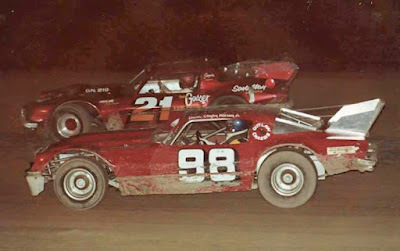 Clayton Petersen Jr. (98) races Odie Robertson (21) at Colorado National Speedway in 1980. Petersen won the Colorado Challenge Cup in 1978 while Robertson was two-time winner in 1975 and 1980. Omaha, Neb. - Stories about race track promoters could probably fill a library. Stories about them run the gamut of possibilities. One such promoter that I’ve heard many stories about is George Butland, the owner of Colorado National Speedway near Erie, Colorado. The first thing that made George unique is that he was born in China and could speak the language fluently. George ended up in Colorado and got hooked on auto racing. First, he bought and ran a salvage yard (did you ever think about all the racers that owned salvage yards). It was called GB Auto Salvage. In 1972, George and Colorado racer Larry Dechant purchased the Colorado National Speedway (CNS). At the end of the 1973 George purchased Dechant’s interest and became sole owner. 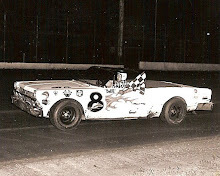 Local ace Odie Robertson captured the inaugural Challenge Cup, then in 1976 invaders started showing up and it was Tom Bartholomew of Waterloo, Iowa picking up the win. The next year, Kansas City’s Terry Bivins took the honors. 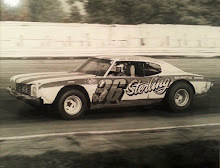 Then along came 1978 and a driver from Grand Island, Nebraska named Clayton Petersen, Jr.
Seventy cars from 10 states were on hand for the 1978 version of the race, but Petersen destroyed the field winning the 75-lap feature by half a lap. After some discussion due to a protest being lodged, second place was awarded to Les Stadel of Rapid City, S.D. Terry Bivins was running second to Larry Stromer of Grand Island, Neb., when Stromer spun out. Bivins was send to the back of the pack and but put on a driving display getting back up to finish third. Bob Shryock finished fourth. The 1979 version of the race turned into a wild affair during the 75-lap A-main. A star-studded field of over 70 late models from Iowa, Nebraska, New Mexico and Colorado were hand for the two-day event. Heat race wins went to Bob Shryock, Tom Bartholomew, Butch Speicher, Bill Leibig, Steve Lewis, George Brazil and Kent Tucker. Clayton Petersen, Jr., Ray Slife, Ken Tadolini, Paul Garrison and Dave Chase won consolation races. 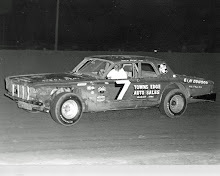 The 75-lap feature started out with the lead being swapped by Kent Tucker, Bob Shryock and Tom Bartholomew. As the race progressed the trio steadily pulled away from the field. At the halfway mark Shryock took command with Bartholomew shooting low to pass Shryock, but instead the two locked bumpers and spun into the infield. The lead was assumed by Joe Kosiski, who had moved up from his sixth row starting position. Kosiski worked his way through traffic and appeared to be a sure winner, when with three laps to go, George Brazil ran into a slower car, bursting his radiator and spinning out of control. Brazil skidded right in the path of the leaders and Kosiski braked hard and went high to avoid Brazil. This allowed Bill Liebig to go low and take the lead and hold on to win the race. After the race, officials ruled that since all forward motion had continued and no contact was made between the leader, the yellow flag was not necessary, and the finish would stand. A heartbreaking way to lose a race as far as Kosiski was concerned. Things had started off on Thursday night with Odie Robertson winning the preliminary feature followed by Clayton Petersen, Jr. and Bob Shryock. There was plenty of action on Friday night. Mike Crotty got hit in the rear end which tore the filler spout of his fuel cell and sent gasoline spilling all over the race track. It erupted in a huge ball of flame. Crotty was able to leap out of the car and suffered only minor burns to his hands. His car was not so lucky as it was destroyed. Later in the same race, Joe Wallace of Kansas City, Kansas and Dennis Selting of Huron, South Dakota got together coming off turn two sending both hard into the backstretch wall. The damage to their cars was so severe they were both loaded on their haulers by the wreckers. At events end it was Joe Kosiski picking up the win followed by Tom Bartholomew and Craig Spetman. The Sixth Annual Colorado Challenge Cup feature in 1980 wasn’t as exciting as the previous years. Ode Robertson of Littleton, Colorado took the lead from Omaha, Nebraska’s Joe Kosiski on lap 10 and was never headed the rest of the distance despite a red flag on lap 20 and a couple of yellows. Robertson drove to a win of nearly one-half a lap. Clayton Petersen, Jr. held on for second after suffering a flat tire in the waning laps of the race. Butch Speicher finished third followed by Tom Bartholomew and Fritz Wilson. Early leader Kosiski suffered a broken rear axle and faded to sixth. “It ain’t over until it’s over” certainly held true for the Seventh Annual Colorado Challenge Cup held on September 12, 1981. Springfield, Missouri’s Larry Phillips took the lead at the drop of the green and driving like a man possessed opened up a half-lap lead over second place Mike Niffenegger of Kalona, Iowa. Coming down for the white flag on lap 49 Phillips engine let go on the back stretch, ending his chance of winning the Challenge Cup. Niffenegger led the last lap and found himself in victory lane with a $3,500 paycheck. 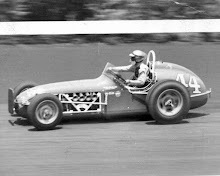 Joe Kosiski was not far behind in second with Shawnee Mission, Kansas driver Andy Claiborne in third, Gillette, Wyoming’s “Fast Freddie” Lundock in fourth and George Brazil fifth. Brazil had a long day after blowing an engine in his heat race the night before. First, he had to qualify through the last chance race, which he won. Then he started in the back of the 20-lap B feature and won that event which gave him a 21st starting position in the main event. For his 80 laps of racing, Brazil pocketed $830. 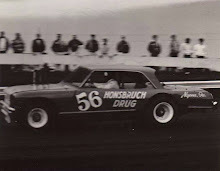 The main event saw just one caution flag, that being just after the halfway point of the race when Lampe, Missouri’s Ferris Collier hit the front stretch wall destroying the right front suspension on the Don Carpenter Camaro. Even that yellow was probably unnecessary as Collier easily made it to the pits. Other top runners having bad luck included; Billy Moyer of Des Moines who developed magneto trouble and Steve Lewis of Arvada, Colorado who blew engine. The Colorado Challenge ran for several more years and eventually the Colorado National Speedway would be paved, thus ending the annual migration of numerous dirt late model teams to Butland’s facility located on the foothills of the Rockies.